Are you a proud Minnesota homeowner? If so, you should consider buying a residential generator. It’s a smart investment that pays off in the form of safety, security and protection of your property. Reports indicate that the U.S. power grid experiences outages 285% more frequently today than in 1984, when officials first began collecting data on power outages. Back in July, the Northern States Power Co. experienced a massive outage that left more than 50,000 Minnesota residents without power. This wasn’t just a minor outage, either. As revealed on the Department of Energy’s (DOE) website, affected residents didn’t have power for more than 22 hours! Of course, it’s still early in the year, so you can expect even more power outages before winter is over. The second-most northern state in the U.S., Minnesota is known for its bone-chilling temperatures. According to the Minnesota Department of Natural Resources (MDNR), the state’s average winter temperature is 16 degrees Fahrenheit in the south and 6 degrees in the north — well below the temperature at which water freezes (32 degrees Fahrenheit). If the local power grid goes down, a generator allows your home’s central heating to operate as intended, without any disruption. Being that Minnesota is known for its cold winters, power outages are not only a nuisance; they also pose a very real safety risk to residents. Can you image being without heat for a full day and night? The sub-freezing temperatures increase the risk of hypothermia, which is particularly dangerous to young children and the elderly. 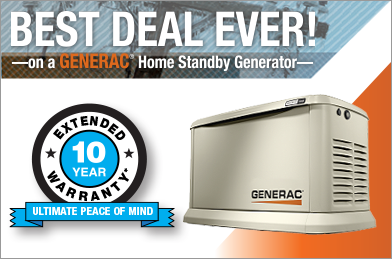 A generator can even protect your home and property from damage. Heating, ventilation and cooling (HVAC) systems serve two primary functions: control the indoor temperature, and lower the relative humidity level. If and when your home’s power goes out, humidity levels may increase, creating an ideal environment in which mold and mildew will thrive. There’s also the issue of structural damage to your home associated with excessively cold or hot temperatures. Heat causes materials such as wood to expand, while cold causes things to contract. Therefore, extreme fluctuations in temperature may seriously damage your home. Furthermore, desktop computers, laptops, televisions, video gaming consoles, cable/satellite boxes, stereo systems and other electronic devices are susceptible to damage from extreme hot and cold temperatures. Residential generators are more than just “back up” devices in case of power outages; you can also use them for camping and similar outdoor recreational activities. Power output. Arguably one of the most important factors to consider when buying a new generator for your home is power output. Smaller generators may offer 3,000 watts of power, while larger models generate 20,000 or more watts. Fuel source. Of course, you’ll also want to consider the type of fuel used by a generator. Nearly all residential generators use one of four fuel types: propane, gasoline, diesel, or natural gas. Automatic start. A useful feature included in many residential home generators is automatic start. Once set up, it automatically turns on after detecting a power outage. Portability. Consider portability when choosing a generator. Some generators feature heavy-duty wheels, allowing owners to easily move them. Price. How much money are you willing to spend on a new generator? Analyze your finances and set a budget. Keep in mind that a generator is an investment that pays off in the long run. Protect your home from unforeseen power outages and related damages by purchasing one of our industry-leading residential generators. For more information, contact us today.